monday monday.com logo monday.com Created with Sketch. Blog Created with Sketch. "I want to hug the people that created this software"
We’re changing our name to monday.com! When Roy and Eran co-founded dapulse back in 2014, they were determined to create a new kind of management tool. They spoke with hundreds of people about the challenges they face at work, and then built a product that’s intuitive, non-imposing, and fast—a tool that teams love to use. They had both been developing products since they were kids, and each had some hard-earned successes and failures under their belt. They knew that in order to make this new venture a success, they had to launch the product fast, get feedback from customers very early on, and quickly iterate and improve. At that stage, what they would call the company was the least of their concerns. We started by marketing dapulse to startups and tech companies. We were familiar with their pains and struggles, after all, and thought that other teams like ours would want to build a culture of transparency to keep everyone focused on the big picture. churches. Construction companies. Schools and universities. The Boston Celtics! As we grew, we were surprised to see that our customer base had expanded across 200 different verticals, 70% of them outside the tech sector. It’s hard to track who’s doing what and when. People feel like they’re slaves to spreadsheets and email. Meetings become endless and exhausting. Motivation wanes. Discontent settles in. Office politics thrive. It became clear that the name dapulse was limiting. We need a name that’s easy to spell, easy to pronounce, and easy to remember. A name that represents what our product is here to do and how it impacts real people’s lives on a day-to-day basis. And perhaps most importantly, we need a name that reflects our incredibly diverse and infinitely inspiring community of customers. So why monday.com? 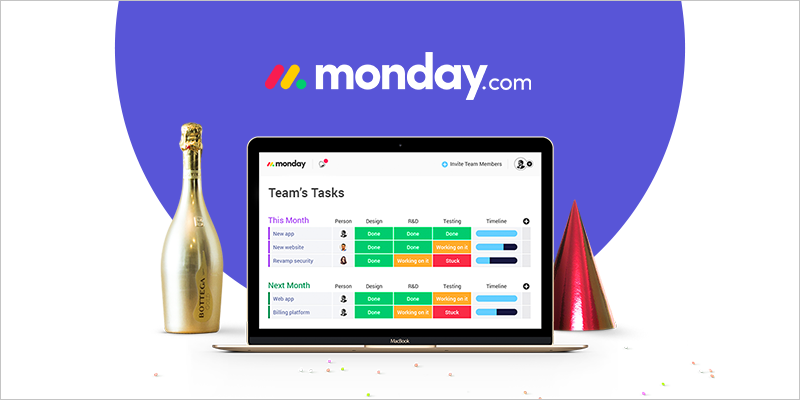 As Roy said, “I always struggled to find a way to describe what our tool does in a sentence, but I can easily describe it in a word: Monday.” For billions of people all around the world, Monday means work. All that is good, all that is hard, and all that is real about work. We are aware that Mondays are many people’s less-than-favorite day. And actually, that’s sort of the point. We embrace controversy when it’s meaningful, and in this case, it speaks to our very deepest values. How do you feel when the workweek starts? Is it anxious? Stressed? Excited? Optimistic? Overwhelmed? So what does this mean for our current community of customers? Our product will remain exactly the same: pulses are pulses, boards are boards. It’s just a name change. You’ll have the chance to switch your account from dapulse to monday throughout December. Some of you volunteered to go first, in which case, it’s happening this week! All accounts will be switched in January. Very little will change during the switch—the web address of your account domain will automatically redirect, you’ll see a new logo, and you’ll have to download our new monday mobile apps. That’s it! This is just the beginning. Helping you work better as a team is what motivates us every day. Stay tuned for what’s to come—and thank you for being part of this journey! How we make all information available to everyone on our team. It's been an amazing year, but our work is just beginning.